This year the Brendan McMahon Charity Rinks was to raise funds for Carrick Cancer Society and what a great event it was for all concerned. Over 112 people entered the Rinks competition in which one Oriel Men’s Zone player played with 3 others who were pulled out of the hat. The event created great harmony and banter within the zone with combinations you could never dream of playing together. With groups of 4 everyone was guaranteed 3 games. This gave everyone plenty of bowls for their money. After a great first day in which we managed to raise €1,750. 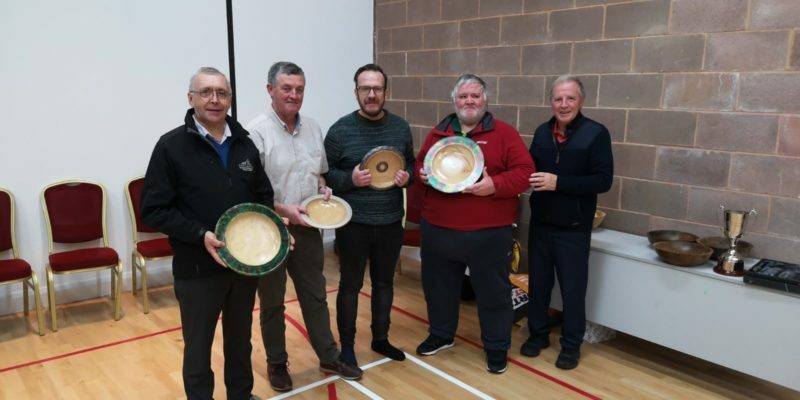 The finals night took place last Friday in Cullyhanna. Conor Mackin along with Maura Martin, Sean Daly and Tom Daly comfortably beat Micheal Savage along with Brid Duffy, Christina Holmes and Brendan McCabe. 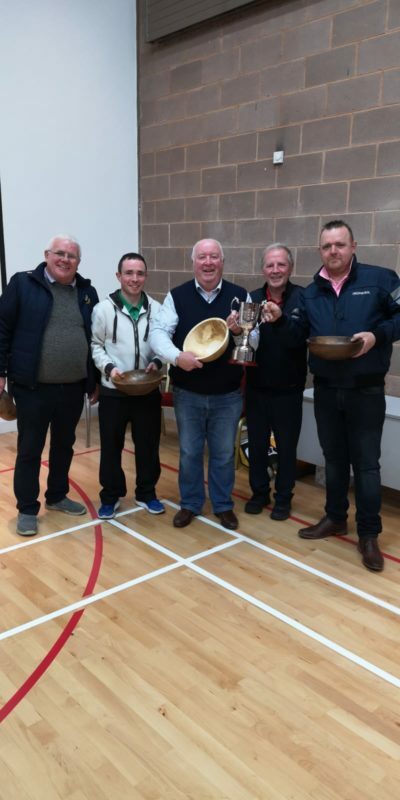 Noel Mackin with Bernie Hammil, Gill Rouiller and Greg Marron beat Thomas Martin playing with Jim Rafferty, Eoin McEnaney and Sean Smith with an end to spare. Finally the closest game of the quarter finals saw Gerry Crosby, Gerry McAteer, Tom Lynch and David McGuiness overcome Conor McEnaney, Jimmy McMahon, Mary Larney, and Caroline McSherry by 3 shots. The final Kevin’s rink continued were they left off racing into an 11-0 lead. Gerry then picked up a 5 but the lead was to big and left Kevin Jim Colin and Nicholas victorious. Another draw was held which raised another €150. Jimmy McMahon then presented the prizes and the Brendan McMahon Memorial Cup to the victors. 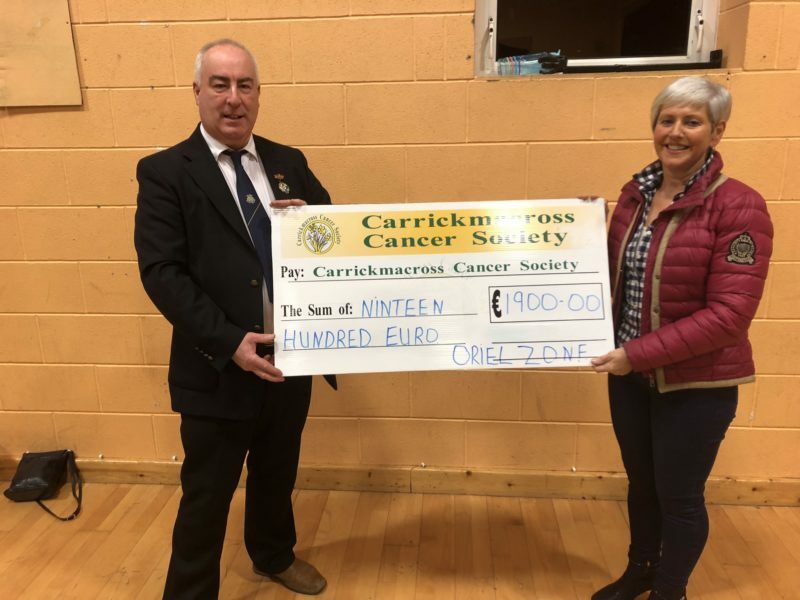 The Cheque of €1,900 was then presented to Pauline Fox (Carrick Cancer Society) on behalf of the Zone by Gerry O’Hare. Once again thanks to all who participated and donated money to the charity. It was a cause close to our families heart after the help they gave our Dad during his last few months with us.